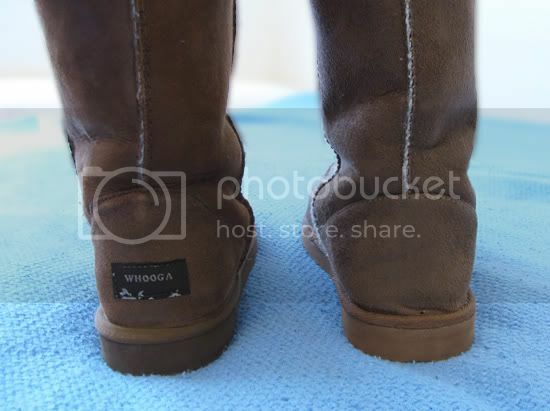 Back in August I received a pair of ugg boots to review from Whooga and have since worn them in place of my cheapy Cotton On ones every day while at home. 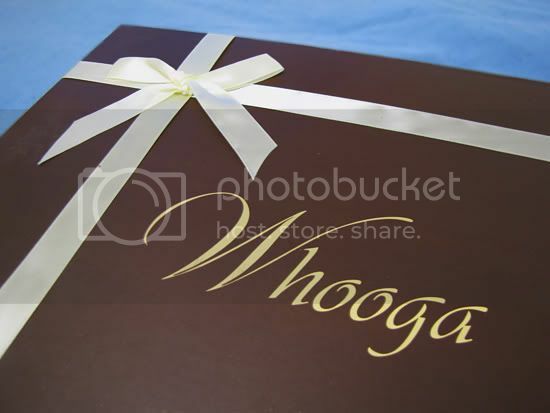 Whooga is an Australian owned ugg boot company who also cater to the UK, USA and Europe. 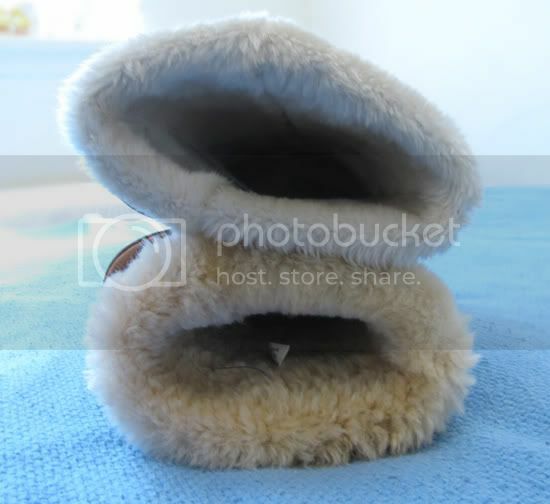 Their claim to fame is that they use the best quality merino sheepskin fibers in their ugg boot linings to offer softer, warmer and more comfortable ugg boots at a better price point than their competitors. Their women and men sizing charts offer conversions in inches, centimeters, EUR, UK and US sizing to help you pick the right size. They recommend that you measure the length of your foot and then pick the closest corresponding size or size up if you're in between sizes. My feet measure 24cm in length so I went with the tall chestnut boots in size EUR 38/UK 5, which is the size I usually wear in shoes. 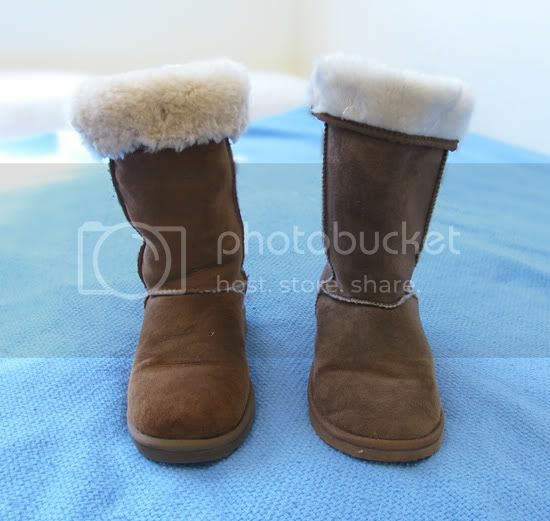 Whooga ugg boots come in seven different colours and four styles; tall, short, mini and weave boots. 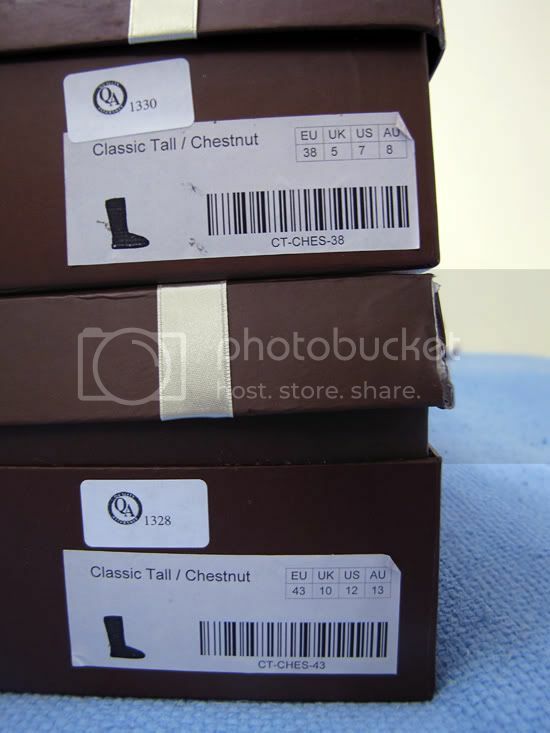 After placing my order for two pairs of tall chestnut boots, which are currently priced at $132.00 each plus $9.00 Express shipping, I received a confirmation email immediately and a second email a few hours later with a tracking number when my order had been dispatched. My order then took 2 business days to be delivered and I was very surprised when it arrived on my doorstep so quickly. 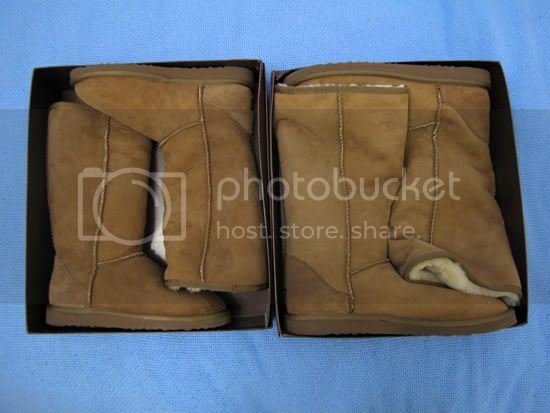 Whooga were also kind enough to send my fiance a pair of ugg boots too, which is why there are two boxes in the photos! The ugg boots came in two large boxes, which were wrapped in plastic packaging. Extra points for cute shoe box design and the finishing touch of ribbon - I always appreciate nice packaging. The boxes had been a bit dented while in transit but the order was correct and the ugg boots themselves were in perfect condition. 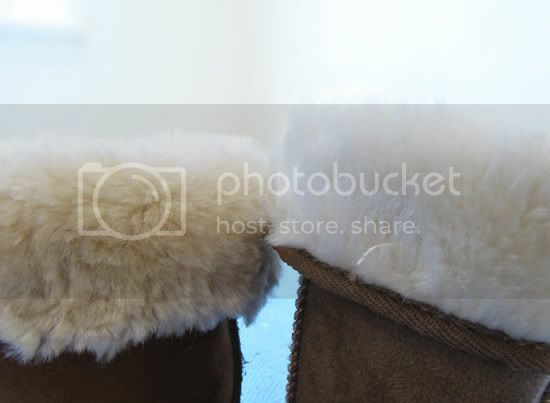 I took a few comparison photos of the differences between my Cotton On ugg boots (on the right) and the Whooga ugg boots (on the left). At first glace they look quite similar, the Whooga's fleece looks thicker and darker while the Cotton On's fleece is much finer and whiter. In person, the Whooga ugg boots feel like real suede and real sheepskin while the Cotton On boots are quite obviously made from synthetic materials. 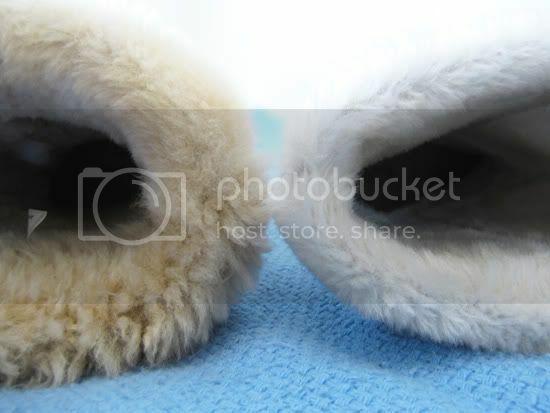 As you can see from the below photos, the Whooga's lining is much thicker than that of the Cotton On boots. Through trialing both boots for a few months each, I've found that the Whooga's are a lot more comfortable, a lot warmer, and showed less signs of wear inside and out than the Cotton On ugg boots. Even after wearing them for a few months, they still look new and the fleece on the inside has remained comfortable and feels very padded, while the Cotton On boots feel quite hard and the texture of the lining is not very nice inside anymore. In conclusion, I personally would buy ugg boots from Whooga again as the ugg boots I received are excellent quality and surpassed my expectations. Although the upfront cost seems expensive, I think that these are worth investing in as they are warmer and more comfortable than the cheapy counterparts and will last much, much longer. 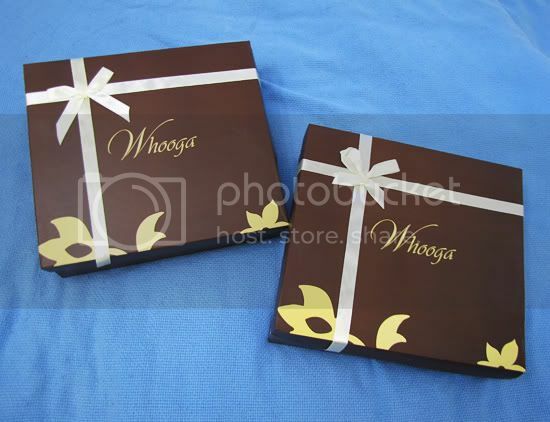 If you have any other questions about buying from Whooga that I haven't addressed, please ask away in the comments. Europeans actually wear Uggs outside the house and consider them 'fashion footwear'. It's like wearing slippers in the street. I just don't get it. I prefer the australian way and wear a cheap substitute at home sometimes. Moncler Shop online supplies all kinds of Moncler Down Coat, Moncler Down Jacket and Moncler Vest for you to keep warm in the frigid winter. bel post. E 'un piacere leggere il tuo post. mantenere inviando, tornerò. 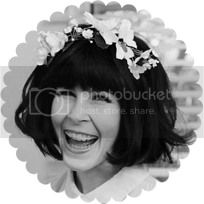 thanks for posting such a nice article. people will be benefited for that. i am also helpfull for that. many important information are include in here. Thanks for sharing your experience. Our own experience with Wooga goes along the same line as yours.